Born in Wisbech, Stuart joined the firm in 1980 straight from school with his career being spent at his home town office. 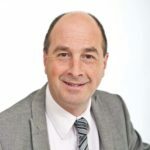 Stuart is an experienced general practice specialist and manages a varied portfolio of Small and Medium sized business and personal tax clients providing a broad range of accountancy and taxation services. He enjoys working with clients to support and develop their business and dealing with tax issues. Stuart has developed great experience dealing with clients in the Charity sector and is a member of the firm’s farming group. Away from the office Stuart spent many years working for a Youth Football Club and also as a trustee for a local charity. Now his spare time is more relaxed and enjoys spectating at Formula 1 Stock Car racing around the country, supporting Liverpool Football Club and, when possible, getting away to Norfolk and Cornwall.